A report from the National Snow and Ice Data Center shows the Arctic's melting ice is resulting in the lowest sea ice levels since satellites started tracking the measurements in 1979. NBC's Brian Williams reports. The amount of summer sea ice in the Arctic has reached a record low in three decades of satellite data, scientists reported Tuesday, with one of them describing recent warm years there as creating a "less polar pole." The decline was expected to continue for at least several more days before cold weather sets in and creates new ice through fall and winter. The area of Arctic waters covered by sea ice was measured at 1.58 million square miles on Sunday, the National Snow and Ice Data Center (NSIDC) reported. That's below the previous record low of 1.61 million square miles set on Sept. 18, 2007, and in line with earlier expectations for the season. "Including this year, the six lowest extents in the satellite record have occurred in the last six years," the center noted on its website. "Parts of the Arctic have become like a giant Slushee this time of year" due to thinning ice, Walt Meier, a scientist at the center, told reporters. That thinner ice also explains how a storm in early August made a significant impact in speeding up the decline this month, Meier said. At NASA, which helps with the satellite data, scientist Claire Parkinson said the trend has been "strongly downward." 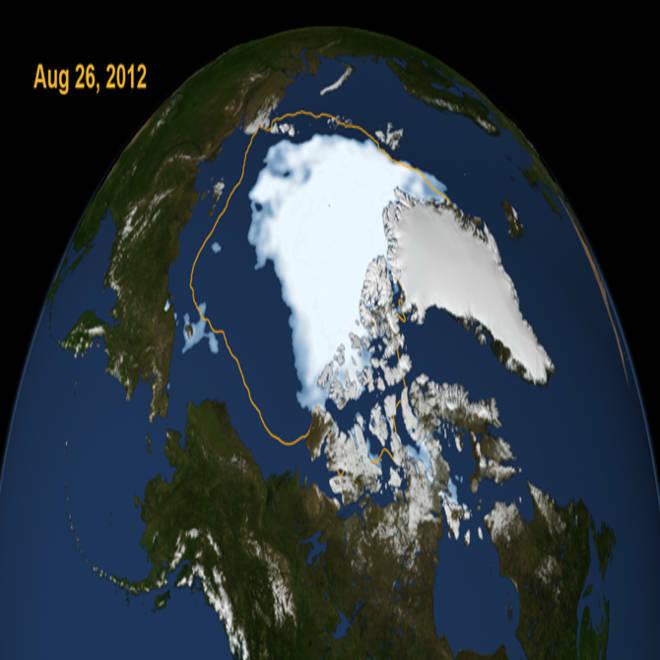 This visualization shows the extent of Arctic sea ice on Aug. 26, 2012, the smallest area in three decades of satellite records. The yellow line shows the average minimum summer ice coverage from 1979 to 2010. The 2007 decrease "stunned" researchers since it was so large compared to previous years, she said, and "this year it's plummeting" further. It's not just sea ice in summer that's been weakened, she added. "No matter what month you're in, it's less ice than it used to be decades ago," she said. The researchers added that manmade emissions tied to global warming offer the best explanation for the decline. Ted Scambos, a senior NSIDC researcher, told NBC News that no one weather pattern explains the downward trend. "Greenhouse gasses are the only consistent explanation for a persistently warming Arctic," he added. "The Arctic was our refrigerator," he said, but the warmer weather of the last five or six years have meant "a less polar pole." Scambos said the Arctic system is too variable to guarantee that each future year would show a decline, but over time he expects the decline to continue. "I think we can expect further declines to new records," he said, "and eventually, an ice-free North Pole." Oct. 15, 2009: The Arctic Ocean will be an "open sea" almost entirely free from ice within just ten years. Thats the claim by a team of researchers. ITN's Tom Barton reports.